As Chinese New Year is fast approaching in only few weeks from now, many Chinese are busy doing last minute CNY shopping and buying decorative items. Therefore, the roads leading to major shopping complex and to Petaling Street would be jam packed even during weekends as many people are busy buying last minute decorations such as plastic flowers, peonies, ang pau packets, laterns, decorative paintings, well wishes banner, Prosperity God pictures, rabbit dolls, etc. Above: This year, colorful tree lights are being sold on top of CNY banner and Rabbit theme items (as this is the year of the Metal Rabbit). This shop is a toy wholesale shop located in Kepong that was very packed during the weekends. 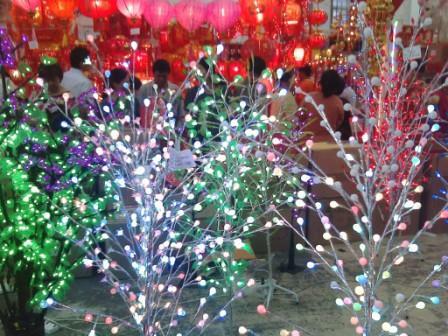 Even though hypermarkets may sell CNY decorative items, many would still prefer to go to Petaling Street for better price bargain and varieties. Alternatively, you can also visit the night markets (pasar malam)- whereby everywhere you walk, you can hear Chinese New Year festive songs being played (sold in the form of pirated CDs/DVDs). If you are heading to Petaling Street, would strongly advise you to take public transport- Putra LRT train and stop at Pasar Seni station. From there, you only need to walk a short distance to Petaling Street. No need to go through the nightmarish jam and difficulty to find parking. Many other wholesale shops- ie selling flowers, gemstones, toys, handbags can be found in Petaling Street- but these shops are usually closed on Sundays. 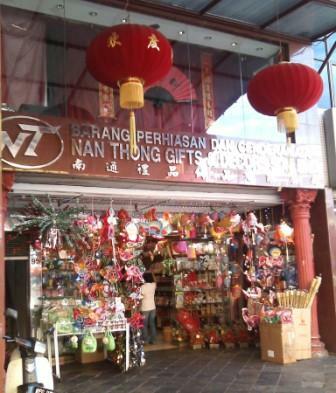 Nam Thong (located opposite the old Rex cinema) also sell more high end CNY decorative items. As for CNY cookies, they are available in almost every market. Avoid buying the cookies from hypermarkets as they are usually not fresh and the flour have a stale smell as the cookies are usually made much earlier. Those sold in the daily wet and night markets are more fresh. Usually, they have samples and you are allowed to taste first without buying- you only buy if you like the taste.